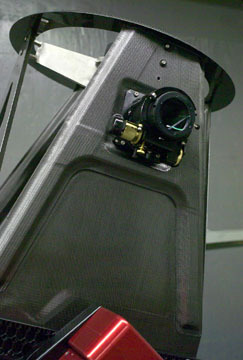 Closer view of the 16" f3.75 Dream Astrograph focuser with 3" Wynne coma corrector installed. The stainless steel spider vanes will be painted flat black. Focuser, camera (and filter wheel) power and/or data lines can be run down one of the side truss arms to the Paramount ME's electronics connection end of the dec plate. No dangling cables to get damaged. This also helps make pointing and tracking more accurate. Note the wide connection points from the black Paramount ME mounting plate to the carbon fiber OTA. There is no adaptor or dovetail plate on this system. This produces less chance for flexure, a lower profile and it reduces the weight the mount has to carry. The OTA has two mounting positions based on center of gravity for different CCD cameras. 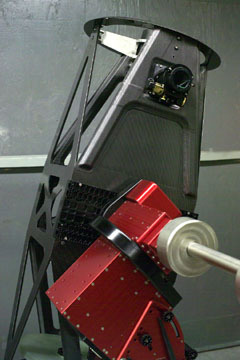 One for the STL-11000 (4.0 lbs) CCD camera use. A second allows for a 2.5 lb camera. Both the top and the bottom of the OTA structure have bolt through locations for small counterweights that allow fine tuning of the balancing. 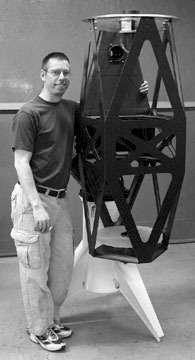 The president of Dream, Shane Santi, standing with the 16" carbon fiber OTA. Shane is 6'-1" tall (for scale).